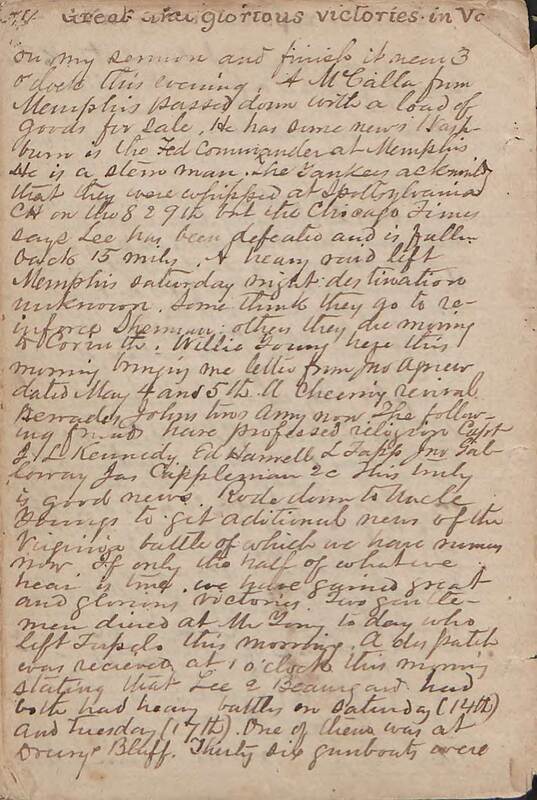 Item description: In this diary entry dated 20 May 1864, Samuel A. Agnew, a Presbyterian minister, teacher, farmer, and prominent local citizen in Tippah and Lee counties, Mississippi, noted confirmed victories at Spotsylvania and Drury’s Bluff and rumors of casualties and Union troop movements. 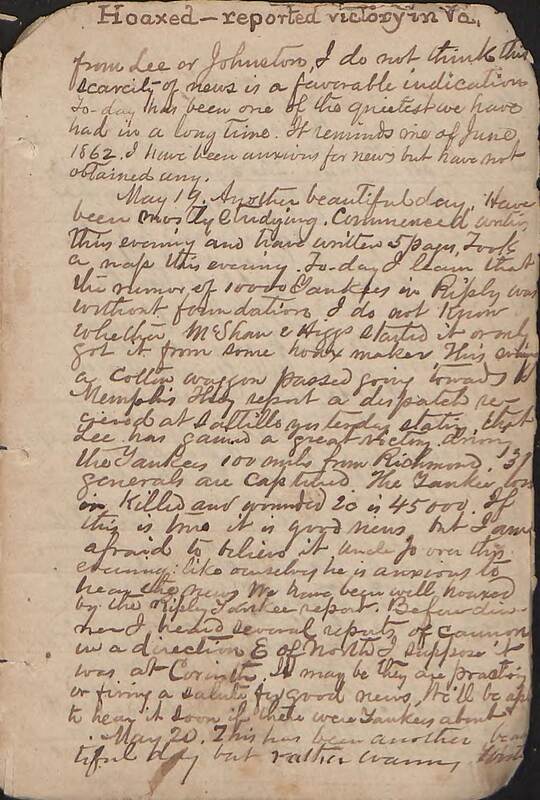 Item citation: from the Samuel A. Agnew Diary #923, Southern Historical Collection, Wilson Library, University of North Carolina at Chapel Hill. 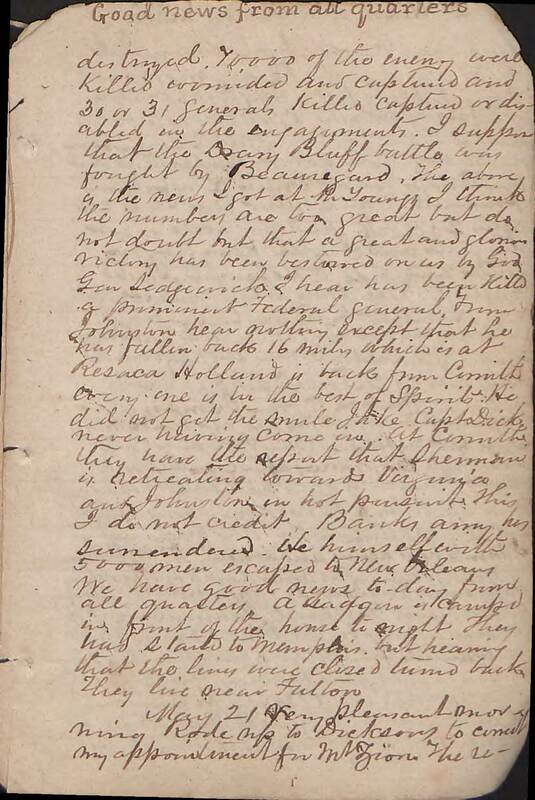 This entry was posted in Southern Historical Collection and tagged Battle of Spotsylvania, Corinth (Miss. ), Drury's Bluff, General Cadwallader C. Washburn, General John Sedgwick, General Joseph E. Johnston, General Nathaniel P. Banks, General P.G.T. Beauregard, General Robert E. Lee, General William T. Sherman, Memphis (Tenn.), Resaca (Ga.), rumors, Samuel A. Agnew, troop movements. Bookmark the permalink.